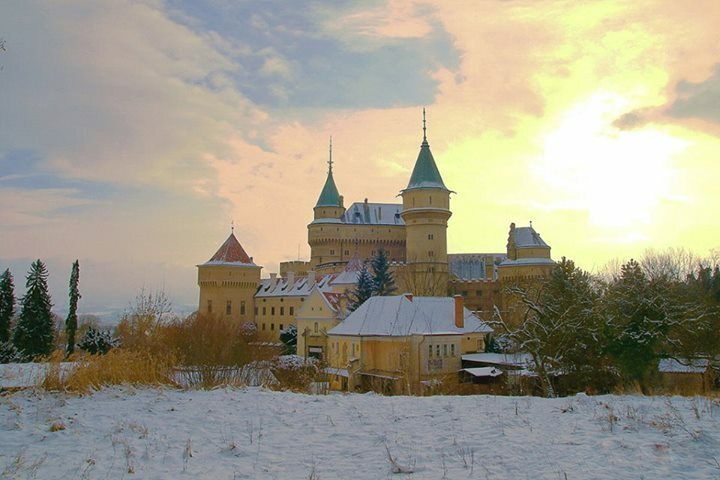 Bojnice Castle was first mentioned in written records in 1113, in a document held at the Zobor Abbey. Originally built as a wooden fort, it was gradually replaced by stone, with the outer walls being shaped according to the uneven rocky terrain. Its first owner was Máté Csák, who received it in 1302 from the King Ladislaus V of Hungary. Later, in the 15th century, it was owned by King Matthias Corvinus, who gave it to his illegitimate son John Corvinus in 1489. Matthias liked to visit Bojnice and it was here that he worked on his royal decrees. He used to dictate them under his beloved linden tree, which is now known as the "Linden tree of King Matthias". After his death the castle became the property of the Zapolya family (see John Zapolya). The Thurzos, the richest family in the northern Kingdom of Hungary (now Slovakia), acquired the castle in 1528 and undertook its major reconstruction. The former fortress was turned into a Renaissance castle. From 1646 on, the castle's owners were the Palffys, who continued to rebuild the castle. Finally, the last famous castle owner from the Pálfi family, Count Ján Franti?ek Pálfi (1829-1908), made a complex romantic reconstruction from 1888 to 1910 and created today's beautiful imitation of French castles of the Loire valley. He not only had the castle built, but also was the architect and graphic designer. He utilized his fine artistic taste and love for collecting pieces of art. He was one of the greatest collectors of antiques, tapestries, drawings, paintings and sculptures of his time. After his death and long quarrels, his heirs sold many precious pieces of art from the castle and then, on 25 February 1939, sold the castle, the health spa, and the surrounding land to Ján Ba?a (of the shoe firm Bata). After 1945, when Bata's property was confiscated by the Czechoslovak government, the castle became the seat of several state institutions. On 9 May 1950, a huge fire broke out in the castle, but it was rebuilt at government expense. After this reconstruction, a museum specializing in the documentation and presentation of the era of architectural neo-styles was opened here. Bojnice Museum is now part of the Slovak National Museum today.